A bad cold and a lot of work resulted in a terrible month for blogging. The A to Z Challenge sputtered out at the letter D (I did record E, though!). So, how did it affect the stats? Surprisingly, it was better than expected. The month ended with 1,730 followers, an increase of just 9. April’s numbers were the lowest in a very long time. The average number of views per day is slightly lower than March. The average number of views per day was 63, the lowest in the past year. Despite that, 5 out of 30 days reached 100 views, which is better than expected. The best day was April 30th with 213 views. The total number of views in April was 1,896, ending the streak with months of more than 2,000 views at 30 months. April ended with 106,184 views. There were 14 posts in April, bringing it to a total of 2,271. In April, there were 80 comments, which was extremely low thanks to a lack of posts. That brings it to a total of 17,212. The most popular post made before April was To Those Who Blame Justin Trudeau for CPP Investment in Mumbai with 483 views. Wow. The Justin Trudeau post I made more than a year ago exploded, receiving a quarter of all views on this blog in April. As for April’s posts, Authors Answer has been the leader again. Here are some posts that didn’t do as well, but you should read. On Twitter, I have 3,620 followers, which is a decrease of 32. I follow 3,684, which is a decrease of 3. I haven’t been particularly active with following on Twitter. I finished with 10,463 tweets, with 55 coming in April. On YouTube, I uploaded 1 video in April. It was a terrible month for videos, as I was extremely busy. I have 420 subscribers, which is an increase of 18 from last month. The month ended with 29,298 views, which is an increase of 1,599, which was actually higher than March. More regular uploading should happen in May. On Facebook, my author page has 87 followers, which is up by 1. On Patreon, I have 0 patrons contributing $0 per month. I’ll be promoting it more this month. I have a lot to do in May. I plan on catching up on the A to Z Challenge for the blog, as well as my science channel on YouTube. Catching up on comments is a priority, as well. I’m hoping May will be a complete turnaround from the last couple months. I shouldn’t be getting sick again. Work is quiet for the month, so I have a lot more free time than I’d like. May should be a good month for the blog! Another month of less work on the blog. 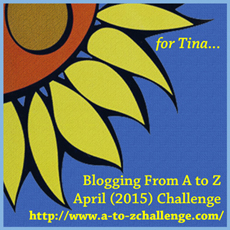 That should change for April, because I’ve started the A to Z Challenge. I had my slowest month in posting for a long time, but the numbers weren’t very different than the previous month. The month ended with 1,721 followers, an increase of 25, which is an improvement. March’s numbers weren’t very good. The average number of views per day is the lowest since September 2014. The average number of views per day was 65, the lowest in the past year.. Only 1 out of 31 days reached 100 views, which is pretty bad. The best day was March 13th with 153 views. The total number of views in March was 2,001, the 30th month in a row over 2,000. March ended with 104,288 views. There were 22 posts in February, bringing it to a total of 2,257. In February, there were 129 comments, which was pretty low, but that’s my fault. That brings it to a total of 17,132. The most popular post made before March was Don’t Believe the Mt. Etna CO2 Meme with 214 views. Yet again, Authors Answer was the most popular type of post in March. But there were a lot of people who wanted to see my post about that meme. Here are some posts that didn’t do as well, but I think you should check out. The Edmonton Oilers Are Going to the Playoffs! I’ve come to the decision to discontinue doing reviews, as I’m not particularly interested in doing them anymore, and they tend to be my least popular posts. On Twitter, I have 3,652 followers, which is a decrease of 15. I follow 3,687, which hasn’t changed from the previous month. I haven’t been particularly active with following on Twitter. I finished with 10,408 tweets, with 87 coming in March. On YouTube, I uploaded 6 videos in March. It was the slowest month in a while, but I was busy again. I have 402 subscribers, which is an increase of 19 from last month. The month ended with 27,699 views, which is an increase of 1,559, which is higher than February despite the lack of videos. More regular uploading should happen in March. On Facebook, my author page has 86 followers, which is up by 1. There’s a lot to expect in April. I’ll be doing the A to Z Challenge, which will account for 26 posts. Each one will feature a video, though they’ll be on my science channel. I also expect to do a lot more with social media, keeping up with comments, and visiting other blogs. I’m definitely looking forward to a major rebound in April. I was busy this month. Too many things going on, and my blogging suffered. I didn’t actually post every day. I still made an average of a post a day, though. The month ended with 1,696 followers, which is a small increase of 10. And I know why. I haven’t been reading blogs as much as I used to. I should get back into that. February’s numbers went down again. But the average per day isn’t the lowest in the last few months. The average number of views per day was 72, the second lowest in the past year.. Only 2 out of 28 days reached 100 views, which is pretty low. The best day was February 1st with 111 views. The total number of views in February was 2,003, the 29th month in a row over 2,000. February ended with 102,246 views. There were 29 posts in February, bringing it to a total of 2,235. In February, there were 119 comments, which was pretty low, but that’s my fault. That brings it to a total of 17,003. The most popular post made before February was What is an advanced society? It had 136 views. Authors Answer was the most popular in February by a long way. But again, a lot of the older posts were carrying the blog’s stats. Here are some of the posts that didn’t perform well, but I think deserve a second look. Science Channel – What’s Going On? Nothing reviewed. Again, I need to get back to doing this. This was the basis for this blog in the beginning. On Twitter, I have 3,667 followers, which is a decrease of 4. I follow 3,687, a small increase of 3. I haven’t been particularly active with following on Twitter. I finished with 10,321 tweets, with 141 coming in February. On YouTube, I uploaded 11 videos in February. It was a slow month again, but I was quite busy. I have 383 subscribers, which is an increase of 17 from last month. The month ended with 26,140 views, which is an increase of 1,513, which is lower. But then, I hadn’t been uploading much. That should change this month. On Facebook, my author page has 85 followers, which is up by 1. On Patreon, I have 0 patrons contributing $0 per month. I’m starting to promote it, but for my new science channel. My promises for February didn’t really come true. I got a lot busier than expected. I will reiterate my goal to keep up with comments, use social media a lot more, work on both booktube and science videos, post at least once a day, and read some blogs. I’m looking forward to seeing what March brings, especially now that I’ve started the science channel. The first month of the year was a decent one. But it wasn’t what I expected. What was supposed to be a two post a day month turned into a post a day again. But despite that, the numbers have increased. And the blog reached a major milestone. January ended with 1,686 followers, an increase of 27. January’s numbers saw an improvement over the previous three months. That was nice to see. The average number of views per day was 78, which was better than the last three months of the year. Only 5 out of 31 days reached 100 views, which is better than December. The best day was January 4th with 127 views. The total number of views in January was 2,426, the 28th month in a row over 2,000. January ended with 100,243 views, passing 100,000 views. There were 34 posts in January, bringing it to a total of 2,206. In December, there were 198 comments, which was slightly higher than December. That brings it to a total of 16,884. The most popular post written before January was once again, INTJ – An Analysis of My Personality. It had 122 views. Older posts remain popular, especially reviews of Shakespearean plays. The newer posts were slow again, thanks to my inability to keep up on social media again. My fault. The beginning of the month was actually quite strong, but it slowed down as I fell behind. As a result, several posts had fewer views than normal. Here are the ones which underperformed and I think you should check out. Would You Move to Another Planet? Nothing, except movie and TV reviews. Must get the book reviews done! On Twitter, I have 3,671 followers, which is a decrease of 3. I follow 3,684, which is unchanged from last month. I haven’t been particularly active with following on Twitter. I finished with 10,180 tweets, with 149 coming in January. I was actually most active in the second half of the month. On YouTube, I uploaded 12 videos in January. Very slow month. I have 366 subscribers, which is an increase of 24 from last month. The month ended with 24,627 views, which is an increase of 1,912, despite the lower number of videos. Some of my older videos are actually remaining popular and ranking well in searches. On Patreon, I have 0 patrons contributing $0 per month. I don’t expect much until I really start to promote it. There’s a lot to do, but I think I can do it. I’m looking forward to seeing what February brings! What is 100,000? It’s 10% of a million. That sounds bigger, doesn’t it? But why am I talking about this number? 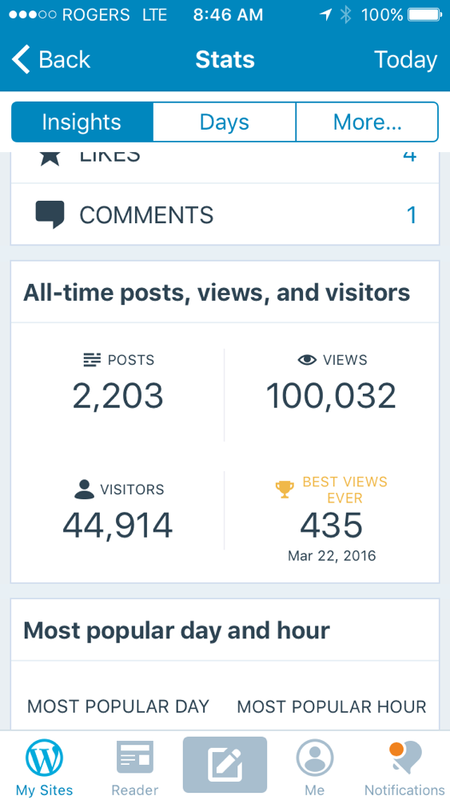 Yes, this blog has reached 100,000 views! I’ve been waiting for this milestone. December slowed down. That was expected. I wasn’t planning on keeping the twice a day posting schedule I stopped doing three months ago. I even missed a day! However, the numbers aren’t that bad. With the holidays at the end of the month, a slowdown was expected. December ended with 1,659 followers, an increase of 26. December ended up being the second slowest month of the year in terms of views. It was better than October, but worse than November. The average number of views per day was 73, which is the second worst of the year. Only 3 out of 31 days reached 100 views, which is the same as November. The best day was December 29th with 121 views. The total number of views in December was 2,254, the 27th month in a row over 2,000. December ended with 97,817 views. There were 30 posts in December, bringing it to a total of 2,172. In December, there were 187 comments, which was the worst in a while. That brings it to a total of 16,686. The most popular post written before December was an old favourite, INTJ – An Analysis of My Personality. It had 109 views. Nothing, despite what I promised. Next week, I have a lot of free time. Expect several reviews. On Twitter, I have 3,674 followers, which is a decrease of 10. I follow 3,684, which is a decrease of 3. I actually followed a lot. I think Twitter did a big purge of dead accounts. I finished with 10,031 tweets, with 159 coming in December. That’s less, but I was busier last month. On YouTube, I uploaded 30 videos in December. I have 342 subscribers, which is an increase of 40 from last month. The month ended with 22,715 views, which is an increase of 2,052. It was another improved performance. The channel is growing. On Facebook, my author page has 84 followers, which is a decrease of 1. Resume twice a day posts on the blog. Read other blogs for 15 minutes a day, including commenting and following. Keep up on comments on this blog. Keep up to date on social media regarding this blog. Start my science channel and post 2 videos a week. Make a new channel trailer for my booktube channel and another for the science channel. Speed up my viewing of Star Trek and finish watching Attack on Titan, ending with a review. Write at least 15 minutes a day. As you can see, there’s plenty to do this month. There are other things I want to do, and I hope to get these things done. I really need to make sure I’ve got social media up to date and am active on it. I’m looking forward to the new year, because it has to be better than 2016! What a strange month. The numbers were not what I expected. I continued with posting once a day, but that didn’t hurt the numbers at all. In fact, this month had the third highest number of visitors for the year, but the second lowest in terms of views. But that’s not where the strangeness ends. November ended with 1,633 followers, a respectable increase of 59. November was the second slowest month of the year in terms of views. That was not unexpected. But it was still better than October. The average number of views per day was 76, which is the second worst of the year. Only 3 out of 30 days reached 100 views, which is a slight improvement. The best day was November 2nd with 112 views. The total number of views in November was 2,290, the 26th month in a row over 2,000. November ended with 95,563 views. There were 32 posts in November, bringing it to a total of 2,142. In November, there were 221 comments, which was very low. That brings it to a total of 16,499. The most popular post written before November was Authors Answer 104 – Best Advice for Authors, which had a whopping 183 views. Another YouTube Channel?? – Science! Nothing done. Need to get on this in December. On Twitter, I have 3,684 followers, which is a very small increase of 26. I follow 3,687, which is up by 76. I finished with 9,872 tweets, with 203 coming in November. I need to manage Twitter better. On YouTube, I uploaded 30 videos in November. I have 302 subscribers, which is an increase of 34 from last month. The month ended with 20,663 views, which is an increase of 1,751. It was a better month, an improvement on October. On Facebook, my author page has 85 followers, which is an increase of 3. Something I plan on expanding is the TV reviews. I already do Star Trek episode reviews, but I also plan on doing other science fiction and fantasy TV and movie reviews. But not episode by episode, just season or series reviews for TV. As for social media, I’m going to do a big cleanup on Twitter for people who I follow, but don’t follow me. There are a lot who follow me only to get followers, then immediately unfollow as soon as I follow. I’ll be weeding those people out. I don’t appreciate people who do that. When I follow someone on Twitter, it’s because I have an interest in following them. If they follow me first, and I return the follow, I expect they want to follow me. However, if they unfollow me immediately, I unfollow them. I really don’t like those tactics. Follow because you want to follow, not because you want followers. Another thing I need to do is comment on other blogs. I need to get back to doing that.